Hi Everyone welcome to my take on a nemesis jungling build that i use very often and with great success especially ganking the middle and solo lanes. Hope you all enjoy the look of the build and i appreciate all comments made below. [*] Until level 6-7 never try to attack on your own. [*] DO NOT DIE before getting to your level 7-8! Same it's only a boring 5 minutes without a deadly but it's worth it. As you can see from the starting items its the standard jungling build just with no wards and more pots to start this is ok to do as nemesis has a slow and enough damage at lowish levels to take jungle camps out with no real issues. - +40 Physical Power And 18% Movement Speed Is Nice For A Early Game Start. - Good overall item for nemesis the extra physical damage gained from debuff is really nice stacking along with it works to do serious amount of damage to mid lane gods and enemy jungler and even solo laner. Magi's Blessing This will help prevent a few CC from the enemy team while you are able to maintain max damage to the enemy gods and help your team in team fights and push hard during the team fights and into the lanes. This seems a little bit pointless towards the end game i get it but nemesis as she gets higher levels does rely on her slow ability a little more and needs the extra mana for the extra costs, The extra % on CDR can help also and the +physical penetration is really epic along with using her ULT. i feel its an overall good buy. This is a must in any situation for nemesis the basic attacks stack up her rage and if your lucky to have ULT ready with 3-4 stacks of rage its the perfect time to use it and it will hit most gods for 800-1200 sometimes if your lucky can be a little more but 800-1200 is standard, Overall i prefer rage over deathbringer due to its cheaper cost and nemesis does enough damage with the other items to not require deathbringer. The Main Skill Is so its the 1st ability you will max level up. The 2nd skill needed is as the shield is such a helpful skill to have during your ganks in middle and solo lanes and preventing yourself getting ganked while killing any jungle camps ( especially the mid camps ). The 3rd skill to level max is her ULT this is basically her IWIN skill use this on heavily geared gods or there tanks/guardians in the ADC lane and nuke the hunter its a win - they guardian wont be able to do sufficient damage to out do the output you will do during the ULT period and your ADC lane will appreciate the extra help during a gank phase. 4th And Last Ability To Max Level Is This is not a damage useful ability it's just there to get you into a gank position and then get yourself back out after the gank. Skill level order at top of this guide is the best it works for a jungler. Best Ultimate a Jungler could ask for.. 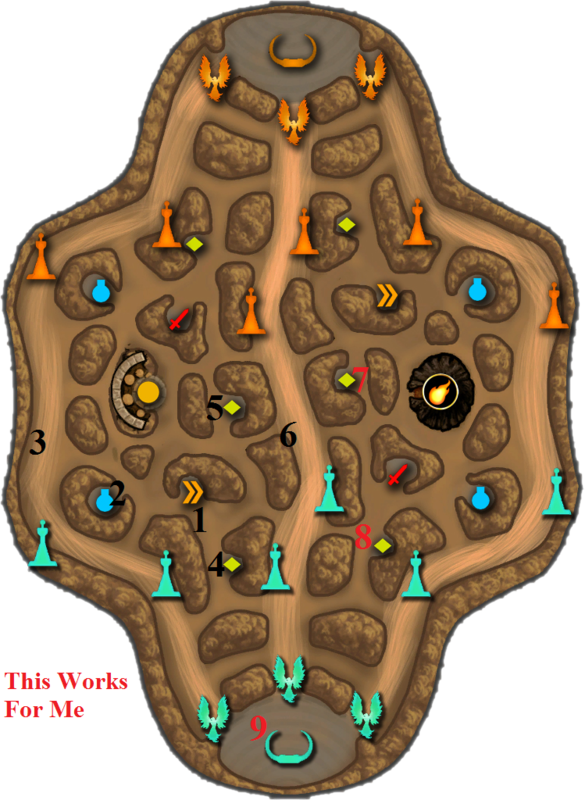 This is how you would jungle as a nemesis and the order in which to take the camps or move around the map. Most of the time in teamfights will be the main target as she can unleash a lot of damage over time in the area with her , Along with her ULT , Can be a serious amount for the enemy team to contend with. As for teamwork is a Mid-late game badass. You never ever attack on your own in the beginning of the game. You can kill camps, kill minions, and try to get coins without dying. Don't worry, it's only for a couple of minutes if you did not die. If you find your team attacking all you need to do is attack with them. I should really begin a collection of facepalm reaction pictures. Thor has burst. Serqet has burst. Loki has burst. That is what burst looks like. 97280 Subzero008 *facepalm at "insane burst"* I should really begin a collection of facepalm reaction pictures. Thor has burst. Serqet has burst. Loki has burst. That is what burst looks like. gotta agree with the person above. you should get Jotunn's Wrath as second item as the cdr is really great early with helping you clear and the mana allows you to stay in the jungle even longer. This build inst the best you need boots -> jotunn -> executioner thats her core qins isnt good to rush anymore cause of the neft and it goes off hp which they wont have much of early game magis isnt good anymore also mail of renewal is pretty good for her though. 97256 Vuranium This build inst the best you need boots -> jotunn -> executioner thats her core qins isnt good to rush anymore cause of the neft and it goes off hp which they wont have much of early game magis isnt good anymore also mail of renewal is pretty good for her though. After testing some more I have come to the conclusion that this build works for me really well! I had a game where the Jungler was out levelling me by about 3/4 levels by mid game and thats when this build really shines, I was able to duke him out and get his health out loads, that Qin's Sais is definitely a must for Nemesis, and like you said unless you get some early kills and can get Qin's up without needing the boots to chase you'll really do well early game too. Like I said the mid and late game is great with her, I'm going to fiddle with the build a little when I have time and swap a few items I like, and maybe more feedback with my results. Thanks for your build man, really makes me like nemesis alot more! 96293 Kylui After testing some more I have come to the conclusion that this build works for me really well! I had a game where the Jungler was out levelling me by about 3/4 levels by mid game and thats when this build really shines, I was able to duke him out and get his health out loads, that Qin's Sais is definitely a must for Nemesis, and like you said unless you get some early kills and can get Qin's up without needing the boots to chase you'll really do well early game too. Like I said the mid and late game is great with her, I'm going to fiddle with the build a little when I have time and swap a few items I like, and maybe more feedback with my results. Thanks for your build man, really makes me like nemesis alot more! Good guide, I only got 10 minutes in and they surrendered. It's my third or fourth time playing nemesis and it felt a lot better than what my friends had been telling me to build, the only thing I changed was finishing the boots over finishing qin's sais for the movement speed so I could get around faster for helping team mates in the early game, I will have a full game soon and report on the success, thanks! 96085 Kylui Good guide, I only got 10 minutes in and they surrendered. It's my third or fourth time playing nemesis and it felt a lot better than what my friends had been telling me to build, the only thing I changed was finishing the boots over finishing qin's sais for the movement speed so I could get around faster for helping team mates in the early game, I will have a full game soon and report on the success, thanks!